The challenge over at the SUO challenge site is an interesting one – use Project Life supplies for a project! I didn’t want to make a scrapbook page but decided to use the stuff for a card. Back when the new catalog came out I bought the Everyday Adventure Project Life kit along with the accessories. I bought it so I could show it to people. Well…that’s about all I did with the kit so using it for a project was so cool and easy! 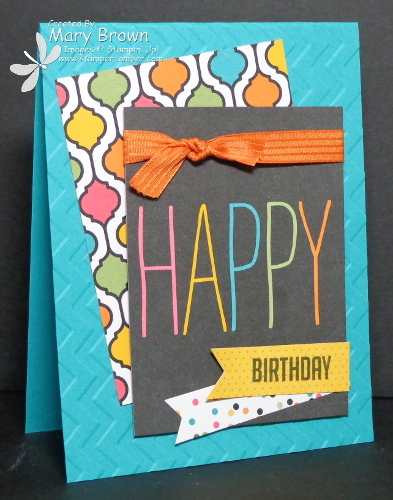 Project Life multicolor print – trim to be 3 x 4 and add to card front. Tie some Tangelo Twist Stitched Satin Ribbon around the multicolor HAPPY panel and add to card front using dimensionals. Cut a 2 x 5/8 banner from the yellow/orange dotted print and stamp BIRTHDAY from the Hooray It’s Your Day set using Basic Black. Layer onto multi color dotted day from the accessory pack then onto the card front to finish this off. This entry was posted in SUO Challenge and tagged Hooray It's Your Day. Bookmark the permalink.